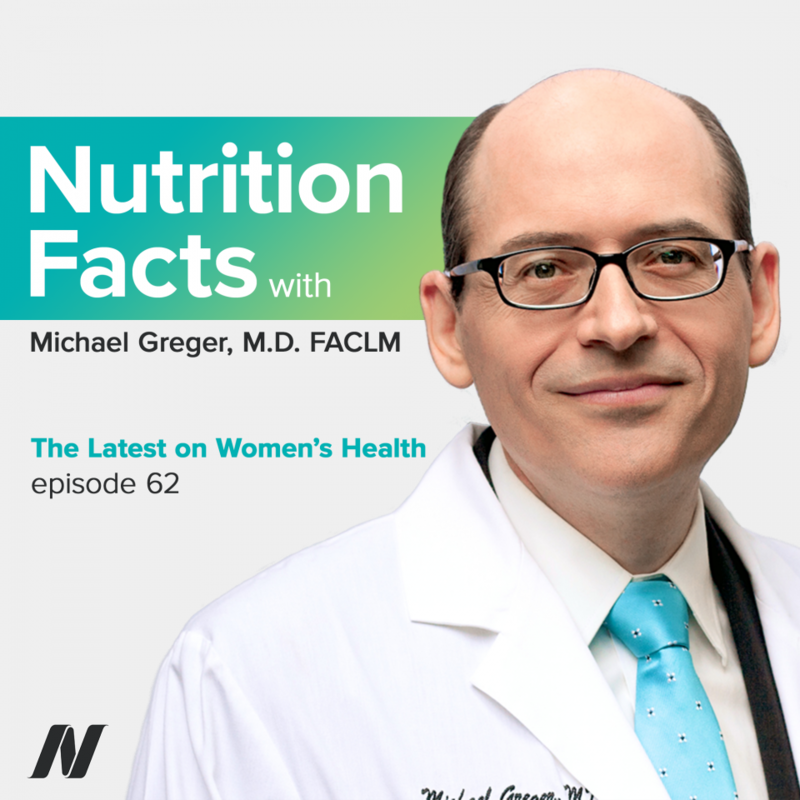 On today’s show I discuss some of the latest research affecting women’s health, including diet remedies for menopause, calcium deficiencies, and the rise in blood lead levels. This episode features audio from Soy Phytoestrogens for Menopause Hot Flashes, Should Pregnant Women Take Calcium Supplements to Lower Lead Levels?, The Rise in Blood Lead Levels at Pregnancy and Menopause. Visit the video pages for all sources and doctor’s notes related to this podcast. On today’s show, we’ll take a look at some of the latest research affecting women’s health. Our food choices may play a significant role in issues affecting women, including menstruation and menopause. Could, for example, soy food consumption explain why Japanese women appear so protected from hot-flash symptoms. Here’s the story. Estrogen treatment, very effective reducing menopausal symptoms; unfortunately, the downside is not only the uterine cancer, but blood clots, strokes, “and cognitive impairment.” Taking progesterone-type compounds with the estrogen helps prevent the uterine cancer, but increases the risk of heart attacks; more stroke risk, breast cancer, more clots, and dementia. So, what’s a woman to do? Well, the 80% hot-flashes figure is not universal; maybe “80-85% in European and American women,” but it may be as low as just 15% in places like Japan. In fact, there’s not even a word for it in the Japanese language, which supports how relatively rare it is. Maybe the phytoestrogens in soy are helping? Studies of soy phytoestrogens in pill form showed extraordinary results—a significant drop in hot-flash presence, number, and severity, from 100% of women suffering at the beginning, to only 31% suffering by the end of three months. The average number of hot flashes dropped from about 120 a month down to 12. But, the problem with studies like these is that there’s no control group to control for the placebo effect. If you look at all the hormone trials, even the women who got the placebo sugar pills had up to a 60% reduction in hot flashes over the years. That’s why any therapy “purported to reduce such symptoms must be assessed in blinded trials against a placebo…because of the large placebo effect…and also because…menopaus[al] symptoms often decline” on their own over time. So, if you saw a study where they gave women a soy protein powder and saw a nice drop in hot flashes over the next 12 weeks, you’d think it looks pretty effective—but that’s the placebo powder group. It’s important to recognize how powerful the placebo effect can be. Over the past 20 years, “more than 50 [clinical] trials have evaluated the effects of soy foods and [supplements] on the alleviation of hot flashes.” Compiling the best ones together, the placebo groups got about a 20% drop in hot-flash severity. The soy groups achieved about a 45% drop. So, on average, the soy did about 25% better than control. Here’s some fascinating research on the effects of sodium and calcium intake on blood lead levels in pregnant and breastfeeding women. Although our skeleton “has predominantly been considered a storage site for sequestering absorbed lead, bone is not simply an inert storage site. Once deposited in bone, lead can be remobilized from bone” back into the bloodstream if we lose bone—for example, osteoporosis. Even just normal menopause can do it—rising lead levels as our bones start to lose their integrity. But, it’s the “[m]obilization of long-term stores of lead from [the] maternal skeleton…during pregnancy and lactation” that’s the biggest concern. So, to maintain maternal lead levels “as low as possible” during this critical period, we need to minimize bone loss. “Higher calcium intake [has been] associated with lower blood lead concentrations [during] pregnancy.” But, you don’t know if it’s cause and effect—unless you put it to the test. What if you gave women calcium supplements? We explored previously how milk may actually make things worse. What about in Western women, though—already taking in over 1,000 milligrams a day? Would giving them an extra 1,200 milligrams a day cut down on some of that bone flux? Yes, it did seem to cut down on bone resorption by about 16%, “and, thus, may constitute a practical intervention to prevent [the] transient skeletal loss associated with childbearing”—which could release any lead trapped there. But, you don’t know, until you put it to the test. This is a different paper from the same study. The researchers measured what was happening to their lead levels, and that drop in bone borrowing led to a drop in lead release, and so, may help lower exposure to the fetus, as well as the infant, as the benefits continue through breastfeeding. Okay. But, these were women living in Mexico City, who may have been exposed to lead-glazed ceramics, with lead levels approaching 10. What about for women with lead levels closer to the current U.S. average—under 5? We didn’t know, until you put it to the test. Now, breast is still best, regardless. Supplementation or not, “the risks are outweighed by the benefits of [breastfeeding].” But, calcium supplementation may help reduce any risk even further. Of course, better to not build up lead in your bones in the first place. As a famous occupational medicine paper put it a half century ago, yes, there’s all methods of dietary interventions, but there’s only one way, “and one way only,” to prevent lead poisoning: not get poisoned in the first place—anything else just “divert[s] attention” from treating the underlying cause. For other toxic heavy metals, like mercury, for example, that would mean advising women “to avoid the consumption of [fish-that-eat-other-] fish during pregnancy and when breastfeeding to decrease” mercury levels in breast milk. In fact, maybe even before pregnancy, “women of child-bearing age,” period—so you don’t build up mercury in your body in the first place. For lead, that means not living next to a smelter plant, avoiding smoking. Now, there’s one other way to detox your body of lead to protect some of your future children, but it’s not ideal. Remember that menopause study, where postmenopausal women had higher blood lead levels than premenopausal women? Well, even higher still were postmenopausal women who never had children. “The postmenopausal increase in lead levels was less in women with prior pregnancies,” presumably because they had already detoxed some of their lead into their children. Now for a story about the dangers of the lead trapped in our bones. It turns out that lead can leach back into our bloodstream when we temporarily or permanently lose bone mass due to pregnancy, weight loss, menopause, or osteoporosis. Here’s the research. The half-life of lead in the bloodstream is only about a month. That means if you feed people lead for about a hundred days, their blood levels go up and up and, then, if you stop, the lead levels in the blood start to drop, such that within about 30 days, their lead levels are cut in half, and in another month, cut in half again, such that by three or so months, your body is able to remove about 90% from your bloodstream. Now, if you’re chronically exposed to lead, you can have chronically high lead levels in your blood. More than half a million kids in the U.S. have concerningly high lead levels, and “poor people in…politically disempowered communities of color” are at higher risk, regardless of age. But, if you don’t live in those communities, aren’t constantly exposed to lead, why should you care about dietary strategies to lower the lead level in your own blood, if your body is already so good at it? Even if you get exposed to lead here and there, three or four months, and 90% of the lead in your blood is gone. Ah, but the question is: gone where? More than 90% of “lead [in our body] is stored in [our] bone,” and instead of a few months to get rid of it, how about a few decades? So, even if we moved to some like other planet, and had zero further exposure to external sources of lead, we still have an internal source of lead leaching the toxic heavy metal into our system throughout our life. But, if it’s mostly just socked away in our skeleton, what’s the big deal? Well, if you were to lose bone, all the trapped lead could come flooding back into your system. For example, when we lose weight, we lose bone, which makes a lot of sense. I mean, heavier people have a heavier skeleton—greater bone mineral density. Their body has to maintain stronger bones to carry around all that extra weight. So, if we lose weight, do the levels of lead in our bloodstream go up as our skeleton downsizes? Unfortunately, yes; but only if we lose a lot of weight. Lose 10 pounds or so, and not much happens; but lose more like 80 pounds, and the lead levels in your blood can rise 250%. When else can you experience bone loss? Well, osteoporosis, obviously. Women with osteoporosis can lose an average of 3% of their bone mass a year, but even healthy, postmenopausal women without osteoporosis may lose a percentage of their skeleton annually. So, do the lead levels in women go up when they lose their periods? Apparently so. A study of nearly 3,000 women found “a…significant increase” in lead levels after menopause, “provid[ing] evidence that bone lead is in fact…mobilized into [the] blood. A major implication…is that even low level lead exposure, over a relatively long time, may result in increased body burdens of lead which would be releasable in toxicologically significant amounts during…physiological states [where your bone is in flux].” Not just osteoporosis, but, most seriously, during pregnancy and lactation. Now, most of the calcium the baby gets comes from “increased maternal…absorption” of dietary calcium. The mother’s gut starts absorbing 60 or 70% more calcium in the second or third trimester to build the baby’s skeleton. That’s why “[w]omen’s dietary calcium requirements are not increased by pregnancy or [breastfeeding].” Your body’s not stupid; when it realizes it needs more calcium, it just absorbs more calcium. Now, when that isn’t enough, you do end up dipping into the calcium stored in your bones—but not a problem. After it’s all over, your body puts the calcium back into your skeleton, such that six months after delivery, your bone mineral density is right back where you started. That’s why even women who breastfeed for a long time, well past those six months, in pregnancy, after pregnancy, after pregnancy, after pregnancy, end up with no compromise to their bone mineral density later in life—whether measured in their wrists, spine, or hips.